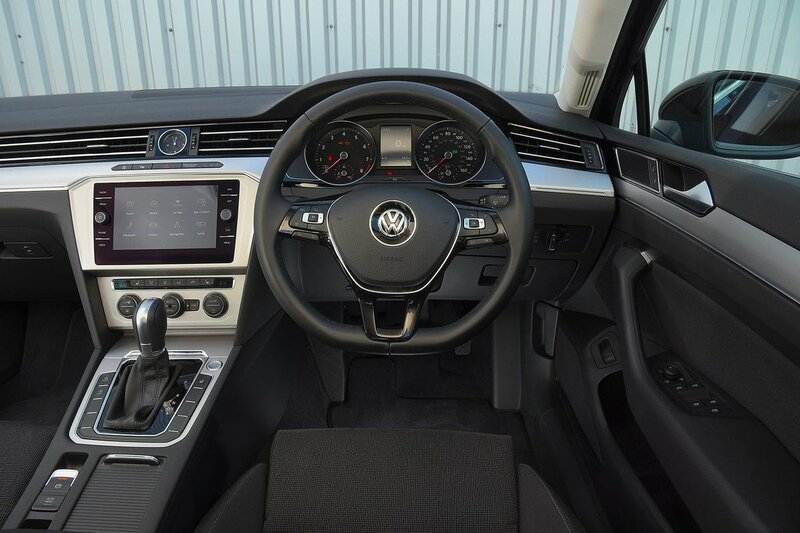 Volkswagen Passat Interior, Sat Nav, Dashboard | What Car? Even entry-level S versions get adjustable lumbar support, while SE Business and upwards combine an electrically adjustable backrest with manual adjustments for height, seatbase angle and under-thigh support. This is a greater breadth of adjustment than you’ll find as standard in almost every rival. With a good range of reach and height adjustment to the steering wheel, too, it's relatively easy to get comfortable. The dashboard is simple to navigate and the standard analogue instrument cluster is easy to read. You can upgrade this to a 12.3in digital screen (standard in GT trim) that shows more information, such as sat-nav mapping. It's a pricey option, but well worth considering for its ease of use and the extra information it provides. 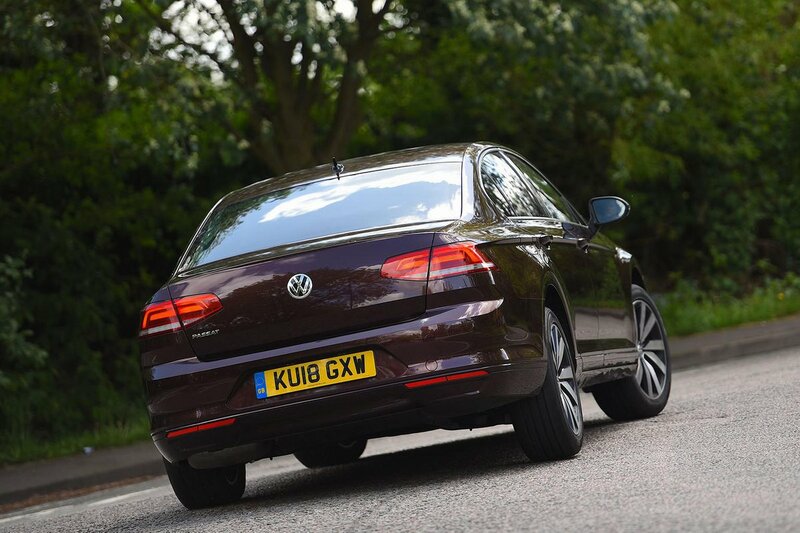 The Passat is up there with the class best when it comes to visibility. It’s still a big car with a sloping bonnet and long boot, so it can be tricky to judge the car’s extremities, but wide windows and fairly upright pillars mean there’s little to obstruct all-round vision. All but the entry-level S come with front and rear parking sensors as standard and an automatic parking system, which detects if a parking space is big enough and steers the car into it, is a reasonably priced option. A rear-view or 360deg camera system are also available for extra guidance when manoeuvring. Bright LED headlights are standard above entry-level S trim. For a small premium you can upgrade these to adaptive LED headlights, which automatically shape the beam to avoid dazzling oncoming traffic. All models have Bluetooth and a digital radio, plus a crystal clear, 8.0in colour touchscreen that comes with Apple CarPlay and Android Auto smartphone mirroring. Sat-nav is standard from SE Business trim upwards. The straightforward menus are easy to navigate, helped by shortcut buttons at either side of the display, and the screen responds quickly to your touch and the graphics are of a high quality. There’s no physical rotary controller like you’d find with Audi’s MMI system, though. A bigger 9.2in touchscreen is optional and adds more functionality, but the benefits aren't worth the additional cash. The standard stereo comes with eight speakers but audiophiles might want to try out the punchier Dynaudio premium system: it has 700 watts of power and plays through 10 speakers. Inside, there’s a good variety of dense-feeling materials, and plenty of eye-catching touches, including the chrome edging and analogue clock, make it look and feel upmarket. There are soft-touch surfaces around the dashboard and on the door handles, with any scratchy plastics reserved to lower down the doors and centre console. 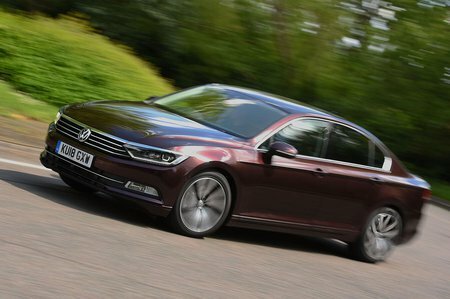 Granted, it's not quite a match for the premium finishes of the BMW 3 Series or Audi A4, but the Passat feels like a genuine step up from a Ford Mondeo or Vauxhall Insignia.